So.. 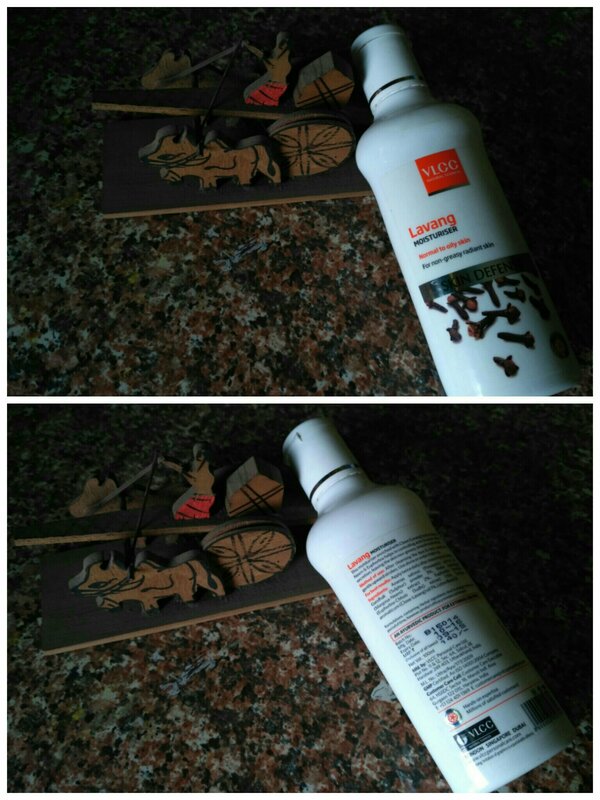 When I actually came across this antibacterial skin lotion from VLCC, I had very little expectations from it! I just wanted a moisturizer for my OILY skin that won’t break me out or make my skin more greasy! DESCRIPTION: Lavang moisturiser- This Moisturiser enriched with Clove (Lavang) and extracts of neem and Euphorbia helps in controlling acne and excess sebum secretion, leaving the skin non-greasy, smooth and radiant. METHOD OF USE: After cleansing the face and neck, apply with gentle upward strokes. Use alone or under makeup. FOR BEST RESULTS: Apply twice daily after cleansing and toning. Ananas sativus(pineapple) extract 4%, gandhak (sulphur) powder 3%, melia azadirachta (margosa neem) extract 2%, Euphorbia thymifolia (Euphorbia chhoti dudhi) extract 1.5%, syzygium aromaticum (Clove Lavang) oil 1%, lotion base q.s. COST: INR 140 for 100ml. But you know what made me fall for this cutie? 1. Dirt cheap and easily available! Buy it from here..
3.Great for Oily Skin, reduces sebum secretion. 4.Great for acne control; it really works! 6.Even dry skinned beauties can use it to control pimples and top it with their regular moisturizer. 1. Sensitive noses will find the fragrance quite overpowering. 2. COMPLETE INGREDIENTS LIST is not mentioned!